This example shows how to minimize an objective function, subject to nonlinear inequality constraints and bounds, using pattern search. For this problem, the objective function to minimize is a simple function of a 2-D variable x.
Additionally, the problem has nonlinear constraints and bounds. Solvers such as patternsearch accept a single input x, where x has as many elements as the number of variables in the problem. The objective function computes the scalar value of the objective function and returns it in its single output argument y. %   Copyright 2005-2007 The MathWorks, Inc. The constraint function computes the values of all the inequality and equality constraints and returns the vectors c and ceq, respectively. The value of c represents nonlinear inequality constraints that the solver attempts to make less than or equal to zero. The value of ceq represents nonlinear equality constraints that the solver attempts to make equal to zero. This example has no nonlinear equality constraints, so ceq = . For details, see Nonlinear Constraints (Optimization Toolbox). Specify the objective function as a function handle. Specify the nonlinear constraint function as a function handle. Specify an initial point for the solver. Call the solver, requesting the optimal point x and the function value at the optimal point fval. To observe the solver's progress, specify options that select two plot functions. 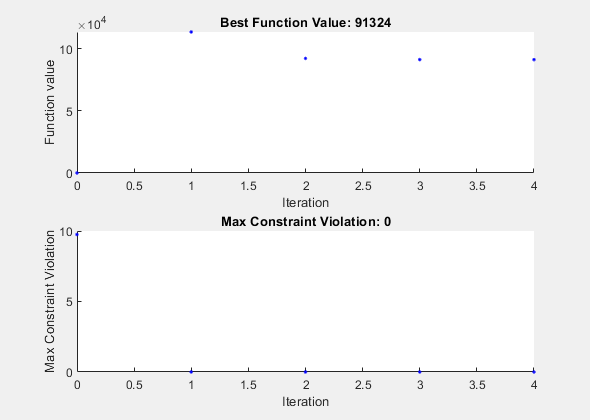 The plot function psplotbestf plots the best objective function value at every iteration, and the plot function psplotmaxconstr plots the maximum constraint violation at every iteration. Set these two plot functions in a cell array. Also, display information about the solver's progress in the Command Window by setting the Display option to 'iter'. Run the solver, including the options argument. Nonlinear constraints cause patternsearch to solve many subproblems at each iteration. As shown in both the plots and the iterative display, the solution process has few iterations. However, the Func-count column in the iterative display shows many function evaluations per iteration. Both the plots and the iterative display show that the initial point is infeasible, and that the objective function is low at the initial point. During the solution process, the objective function value initially increases, then decreases to its final value.